Upon arrival in San Salvador, guests are met & transferred to Suchitoto visiting Ilobasco en route. We Participate in an Indingo Art Workshop; visit art galleries, old churches a cigar artisans. We will travel to Chalatenango visiting La Palma, Citalá and San Ignacio. En route we will visit the Cihuatan archaeological site. After breakfast depart to the jewel of the Mayan World: Joya de Ceren; San Andrés archaeological site which was the worship place of the settlers of Joya de Cerén. Morning departure to San Salvador city tour where we will go to the art craft market place, the anthropological museum and interesting places such as El Boquerón. Farewell dinner. We visit art galleries, old churches a cigar artisans. 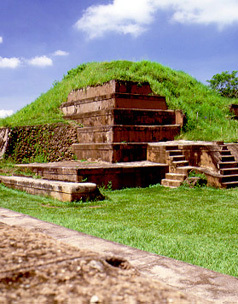 Visit the Cihuatan archaeological site en route to the highlands of Chalatenango. Artcraft workshop in the afternoon. Today we will explore inside these mountains. Experience a typical lunch at a finca (farm); harvesting at another finca. Upon arrival in San Salvador, guests are met & transferred to hotel for overnight. 3. Los Cóbanos Marine Life Boat Tour. Depart to explore a working coffee mill and learn about the process of coffee processing. Continue exploring the Flower Trail ending at Nahuizalco and enjoying a night market. The eco experience of today is following the winding mountain trails through the heart of the verdant, dense forests of the Apaneca- Lamatepec Biosphere Reserve. You will journey inside the mountains on buggies and have a lot of fun. This hike starts in Las Brumas EcoPark, easily one of El Salvador’s best spots to get up close and personal with the volcanoes. This coffee cooperative ecotourism destination is located right in the middle of the three most iconic volcanoes in the country. Vsits to Eco-park El Espino in the Quezaltepeque volcano a sanctuary for more than 106 species of native and migration birds. Get in touch with Mother Nature and fly like a bird during this exciting and safe tour for people of all ages. Today we explore El Imposible National Park, one of El Salvador’s most outstanding wildlife sanctuaries and home to a fantastic diversity of flora. Here you can find over 1,000 species of plants and trees, some of which are endemic (native) to the region. Continue exploring the Park and visit to the Mixtepe Visitors Center to finish up the tour. This natural adventure takes place in one of the most representative and exotic ecosystems of El Salvador’s coastal plains called Santa Rita Protected Area. Walter Thilo Deininger Natural Park represents an important protected area with a diversity of species of animals, medicinal plants, and endangered trees. The park serves as an ecological center of interpretation where different species of the flora and fauna can be studied. Breakfast. Day to enjoy and relax at the beach.